Image caption The report suggests that nearly 40% of people in Northern Ireland have had a conflict related traumatic incident. 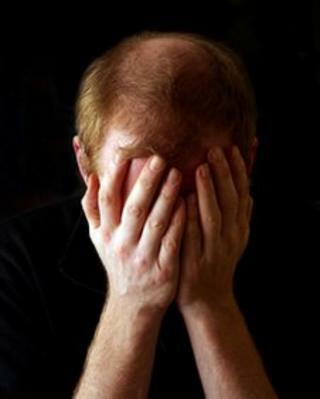 Northern Ireland has the world's highest recorded rate of post traumatic stress disorder (PTSD), according to a major international report. It estimated that PTSD costs the public purse around £175m a year. The same survey was undertaken in 30 countries, including war-hit areas such as Israel and Lebanon. The World Mental Health survey showed that violence had been a distinctive cause of mental health problems for around 18,000 people. The survey was carried out by University of Ulster psychologists and Omagh-based trauma treatment experts, based on World Health Organisation criteria. It suggested that nearly 40% of the population have had a conflict related traumatic incident. The report was based on a survey of 4,340 adults who were questioned between 2004 and 2008. The researchers used 2008 as a sample year for the financial estimate and suggested that the costs linked to those suffering from PTSD would continue to increase as the patients grow older. "The Economic Impact of Post Traumatic Stress Disorder in Northern Ireland" was launched at Parliament Buildings, Stormont on Monday. The report concluded: "Northern Ireland has the highest level of 12-month and lifetime PTSD among all comparable studies undertaken across the world including other areas of conflict." Finola Ferry, a research associate at the Bamford Centre, said: "This is the first ever economic cost-of-illness study to focus on PTSD. "It reveals that PTSD and other disorders associated with trauma represent a significant public health burden here, with economic implications right across society that stretch far into the future. " David Bolton, lead researcher with the NICTT, called for better treatment for those suffering from PTSD. "International research shows that recovery from PTSD is unlikely if sufferers do not have access to trauma focussed-treatment," he said. "There is obvious unmet need and more attention should be given to people and communities with significant trauma related problems, including those needs arising from years of conflict. "The report provides policy-makers with the most reliable available information upon which they will be able to base their choices for the future."